Fig. 10.7. Typical residual stress distribution with depth for the shot-peening process. For lower-strength steels and alloys om can initially reach the yield stress or 0.1% proof stress but this will fade under cyclic loading. Cold rolling of threads, crankpins and axles relies on similar principles to those outlined above with, in this case, continuous pressure of the rollers producing controlled amounts of cold working. Further examples of cold working are the bending of pipes and conduits, cold shaping of brackets and clips and cold drawing of bars and tubes - sometimes of complex cross-section. In some of the above applications the stress gradient into the material can be quite severe and a measurement technique which can produce results over reasonable depth is essential if residual stress-fatigue life relationships and mechanisms are to be fully understood. It has been mentioned above that plastic deformation is almost invariably present in any machining process and the extent of the plastically deformed layer, and hence of the residually stressed region, will depend on the depth of cut, sharpness of tool, rates of speed and feed and the machineability of the material. With sharp tools, the heat generated at the tip of the tool will not have great influence and the residually stressed layer is likely to be compressive and relatively highly localised near the surface. With blunt tools or multi-tipped tools, particularly grinding, much more heat will be generated and if cooling is not sufficient this will produce thermally induced compressive stresses which can easily exceed the tensile stresses applied by the mechanical action of the tool. If they are large enough to exceed yield then tensile residual stresses may arise on cooling and care may need to be exercised in the type and level of service stress to which the component is then subjected. The depth of the residually stressed layer will depend upon the maximum temperatures reached during the machining operation and upon the thermal expansion coefficient of the material but it is likely that it will exceed that due to machining plastic deformation alone. Residual stresses in manufactured components can often be very high; in grinding, for example, it is quite possible for the tensile residual stresses to produce cracking, particularly sub-surface, and etching techniques are sometimes employed after the grinding of e.g. bearings to remove a small layer on the surface in order to check for grinding damage. Distortion is another product of high residual stresses, produced particularly in welding and other heat treatment processes. The principal chemical treatments which are used to provide components with surface residual stress layers favourable to subsequent service fatigue loading conditions are nitriding, tufftriding and carburising. Nitriding is a process whereby certain alloy steels are heated to about 550°C in an ammonia atmosphere for periods between 10 and 100 hours. 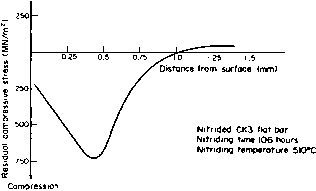 Nitrides form in the surface of the steel with an associated volume increase. The core material resists this expansion and, as a result, residual compressive stresses are set up which can be very high (see Fig. 10.8). The surface layer, which typically is of the order of 0.5 mm thick, is extremely hard and the combination of this with the high surface residual compressive stresses make nitrided components exceptionally resistant to stress concentrations such as surface notches; fatigue lives of nitrided components are thus considerably enhanced over those of the parent material. Fig. 10.8. Typical residual stress results for nitrided steel bar using the X-ray technique. Minimal distortion or warping is produced by the nitriding process and no quenching is required. A special version of nitriding known as "tough nitriding" or, simply, "Tufftriding" consists of the heating of steel in a molten cyanic salt bath for approximately 90 minutes to allow nitrogen to diffuse into the steel surface and combine with the iron carbide formed in the outer skin when carbon is also released from the cyanic bath. The product of this combination is carbon-bearing epsilon-iron-nitride which forms a very tough but thin, wear-resistant layer, typically 0.1 mm thick. The process is found to be particularly appropriate for plain medium-carbon steels with little advantage over normal nitriding for the higher-strength alloy steels. Introduction of carbon into surface layers to produce so-called carburising may be carried out by solid, liquid or gaseous media. 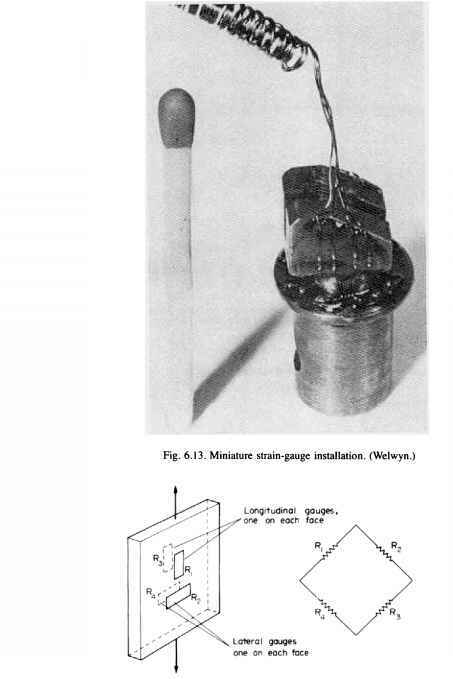 In each case the parent material contained in the selected medium such as charcoal, liquid sodium cyanide plus soda ash, or neutral gas enriched with propane, is heated to produce diffusion of the carbon into the surface. 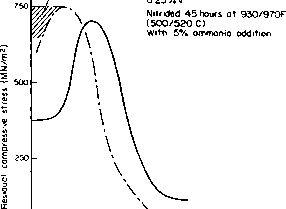 The depth of hardened case resulting varies from, typically, 0.25 mm on small articles to 0.37 mm on bearings (see Fig. 10.9). Fig. 10.9. Comparison of residual stress pattern present in nitrided chromium-molybdenum-vanadium steel and in a carburised steel - results obtained using the X-ray technique. forging. In the two latter cases, however, chemical composition effects are included since carbon is removed from the surface by oxidation. This "decarburising" process produces surface layers with physical properties generally lower than those of the core and it is thus considered as a weakening process. Returning to the more conventional heat treatment processes of flame and induction hardening, these again have a major effect at the surface where temperature gradients are the most severe. They produce both surface hardening and high compressive residual stresses with associated fatigue life improvements of up to 100%. There is some evidence of weakening at the case to core transition region but the process remains valuable for components with sharp stress gradients around their profile or in the presence of surface notches. In both cases the surface is heated above some critical temperature and rapidly cooled and it is essential that the parent material has sufficient carbon or alloys to produce the required hardening by quenching. Heating either takes place under a gas flame or by electric induction heating caused by eddy currents generated in the surface layers. Typically, flame hardening is used for such components as gears and cams whilst induction hardening is applied to crankshaft journals and universal joints. Many other components ranging from small shafts and bearings up to large forgings, fabricated structures and castings are also subjected to some form of heat treatment. Occasionally this may take the form of simple stress-relief operations aiming to reduce the level of residual stresses produced by prior manufacturing processes. Often, however, the treatment may be applied in order to effect some metallurgical improvement such as the normalising of large castings and forgings to improve their high-temperature creep characteristics or the surface hardening of gears, shafts and bearings. The required phase change of such processes usually entails the rapid cooling of components from some elevated temperature and it is this cooling which induces thermal gradients and, if these are sufficiently large (i.e. above yield), residual stresses. The component surfaces tend to cool more rapidly, introducing tensile stresses in the outer layers which are resisted by the greater bulk of the core material and result in residual compressive stress. As stated earlier, the stress gradient with depth into the material will depend upon the temperatures involved, the coefficient of thermal expansion of the material and the method of cooling. Particularly severe stress gradients can be produced by rapid quenching in water or oil. Differential thermal expansion is another area in which residual stresses-or stress systems which can be regarded as residual stresses-arise. In cases where components constructed from materials with different coefficients of linear expansion are subjected to uniform temperature rise, or in situations such as heat exchangers or turbine casings where one material is subjected to different temperatures in different areas, free expansions do not take place. One part of the component attempts to expand at a faster rate and is constrained from doing so by an adjacent part which is either cooler or has a lower coefficient of expansion. Residual stresses will most definitely occur on cooling if the differential expansion stresses at elevated temperatures exceed yield. When dealing with the quenching of heated parts, as mentioned above, a simple rule is useful to remember: "What cools last is in tension". Thus the surface which generally cools first ends up in residual biaxial compression whilst the inner core is left in a state of triaxial tension. An exception to this is the quenching of normal through-hardened components when residual tensile stresses are produced at the surface unless a special process introduced by the General Motors Corporation of the U.S.A. termed "Marstressing" is used. This probably explains why surface-hardened parts generally have a much greater fatigue life than corresponding through-hardened items. Should residual tensile stresses be achieved in a surface and be considered inappropriate then they can be relieved by tempering, although care must be taken to achieve the correct balance of ductility and strength after completion of the tempering process. One of the most common locations of fatigue failures resulting from residual stresses is at welded joints. Any weld junction can be considered to have three different regions; (a) the parent metal, (b) the weld metal, and (c) the heat-affected-zone (H.A.Z. ), each with their own different physical properties including expansion coefficients. Residual stresses are then produced by the restraint of the parent metal on the shrinkage of the hot weld metal when it cools, and by differences in phase transformation behaviour of the three regions. The magnitude and distribution of the residual stresses will depend upon the degree of preheat of the surfaces prior to welding, the heat input during welding, the number of weld passes, the match of the parent and weld metal and the skill of the operator. Even though the residuals can often be reduced by subsequent heat treatment this is not always effective owing to the different thermal expansions of the three zones. Differences between other physical properties in the three regions can also mean that failures need not always be associated with the region or part which is most highly stressed. Generally it is the heat-affected zones which contain sharp peaks of residual stress. In welded structures, longitudinal shrinkages causes a weld and some parent material on either side to be in a state of residual tension often as high as the yield stress. This is balanced in the remainder of the cross-section by a residual compression which, typically, varies between 20 and 100 MN/m2. When service load compressive stresses are applied to the members, premature yielding occurs in the regions of residual compressive stress, the stiffness of the member is reduced and there is an increased tendency for the component to buckle. In addition to this longitudinal "tendon force" effect there are also transverse effects in welds known as "pull-in" and "wrap-up" effects (see Fig. 10.10) again dictated by the level of residual stress set up.